4-H leadership, projects and activities and the interview gives them an opportunity to discuss their 4-H experiences in more detail. The process takes some time, but funds for some of these trips range up to more than $1,000. The experience also helps prepare youth for college and jobs. The M.E. forms are mailed to every eligible member the first week of August and are due the Tuesday after Labor Day. Interviews are conducted within 2 weeks and the trips are awarded during Achievement Night in October. For more information or to download forms, see below. You may also contact a club leader, a member of the Board of Directors, or the 4-H Youth Development office at 715-395-1363. Are you interested in Space, Science, Technology, Teamwork and so much more? If you answered yes, then you should check out our WI 4-H Space Camp Experience in 2019! Space Camp is just as you might imagine – it’s a camp experience where you learn and experience about life as an astronaut, working at NASA, and exploring places beyond Earth! This year’s WI 4-H Space Camp will be held April 25-29, 2019. Our website at https://fyi.uwex.edu/wi4hedopp/space-camp/ will provide you with more information. WI 4-H youth 6-8th grades are invited to register for Wisconsin 4-H Space Camp starting this Wednesday, November 7th at 4 pm. Space Camp is a wonderful opportunity for you to explore your curiosity, meet new friends and develop life skills. Participants take a bus down to Huntsville, Alabama with 4-H members and adult leaders from around the state to participate in the Pathfinder Program at the U.S. Space and Rocket Center. Registration will be open November 7th – January 10th. Registration is limited to 130 participants and will be determined based on age, first come first serve, and a lottery system. ALL youth must register in 4HOnline. Many counties have an application and interview process for financial support for Space Camp. If you received funding/scholarship from your 4-H Leaders’ Association, you are not automatically registered; you must register in 4HOnline. Participants will be notified of their registration status by January 15th. Questions? Please contact Amber Rehberg at amber.rehberg@ces.uwex.edu or Justin Lieck at Justin.lieck@ces.uwex.edu. We hope to see you when we blast off in April! Attention WI 4-H Youth Leaders Grades 8-10…do not miss out on two incredible opportunities to learn and grow! Are you a youth leader in grades 8, 9 or 10? Are you interested in science, space, technology, and robotics? If you answered yes to any of these questions, you might want to consider applying for a WI 4-H Space Camp Counselor position. Participating in Space Camp as a delegate is a preferred qualification, but NOT required. The Wisconsin 4-H Space Camp Counselor Team develops leadership, communication skills and confidence by working together with 4-H Staff Advisors to help campers enjoy and learn more during their experience by leading games and aerospace activities, mentoring new campers, and assisting adult leaders while having fun at the orientation and during the spring program in Huntsville AL. Training is mandatory including a teleconference on Monday, January 27 (7:00-8:30 p.m.), a training workshop on February 16, 2019 (9:00am-5:00 p.m.), and a face-to-face meeting Saturday, March 30 beginning at 10:00 a.m. through 4:00 p.m. Sunday, March 31, 2019. The application is posted online at https://fyi.uwex.edu/wi4hedopp/space-camp-counselor-info/. Please complete the application and submit it to your County 4-H Office so it is received by November 15, 2018, then your County 4-H Educator can write and send a reference along with your application to the State 4-H Office by the November 22. If you do not have a county educator, you may seek a reference from a teacher or other professional who knows about your 4-H leadership skills. A Selection Committee will choose approximately 12 to 15 counselors for the 2019 team. You will receive notification of your status from the WI 4-H State Office around December 15, 2019. A final pool of candidates will attend the February 16th training workshop and the final team will be selected from that pool. If you are selected for a leadership position on the team, registration materials will be sent to you to complete and return by March 1, 2019. Don’t miss out an opportunity of a lifetime by participating in the 2019 American Spirit EAST Experience. The State 4-H office will be facilitating two weeks of American Spirit EAST in 2019; June 7-16 or July 5-14. You can find more information on our website: https://fyi.uwex.edu/wi4hedopp/american-spirit/. The American Spirit Experience is truly an incredible opportunity to further develop your leadership and citizenship skills, all while exploring the east coast. Along with 44 youth grades 8-10 and 5 adult advisors you will have an opportunity to explore America’s heritage. The program has the following objectives for its participants: increase knowledge and understanding of America’s heritage, build awareness of the many steps taken to gain U.S. independence and freedom, further develop skills in leadership and personal expression of values, increase awareness of self in relationship to others and for participants to share what was learned with others. American Spirit Registration opens on November 7th at 4 pm. ALL youth must register in 4HOnline. Many counties have an application and interview process for financial support for the American Spirit EAST Experience. If you received funding/scholarship from your 4-H Leaders’ Association, you are not automatically registered; you must register in 4HOnline. Participants will be notified of their registration status by January 10th. Questions? Please contact Amber Rehberg at amber.rehberg@ces.uwex.edu or Justin Lieck at Justin.lieck@ces.uwex.edu. We hope to see you on the bus to discover and further develop your American Spirit! Every summer, high school students from across the country travel to Washington, D.C. to participate in Citizenship Washington Focus (CWF), 4‑H’s premier leadership and citizenship program for high school students. CWF is more than a Washington, D.C. field trip – it’s an opportunity for 4‑H’ers to learn how to be citizen leaders and make a difference in their communities! CWF participants have the opportunity to enjoy a behind-the-scenes look at our nation’s capital and the chance to meet members of Congress, develop communication, leadership and citizenship skills through hands-on learning and group activities and build new and lasting friendships. If you are in grades 10-12 and are interested in learning more about citizenship and meeting 4-Her’s from across the state and country, than CWF is for YOU! The cost for CWF will be approximately $1,400 per person (the total will be determined as soon as transportation costs are confirmed.) Youth are responsible for the cost of the experience. Many counties facilitate Awards & Educational Experiences Application and Interview Processes to offer scholarships for this and other experiences. If you are unsure of your county’s funding process, please contact your local 4-H Youth Development Staff Member. If you missed the county process and there is financial need; we have a limited number of state financial need-based scholarships of $250- $500. (Details of this are being worked out). Citizenship Washington Focus Registration will OPEN in 4HOnline on November 15 at 4 p.m. Limited space is available for each week, be sure to log on early if you are planning on attending. In 2019, WI 4-H will be participating in CWF June 15-23 or July 6-14, 2019. More information on CWF can be found online at our website: https://fyi.uwex.edu/wi4hedopp/citizenship-washington-focus/. Another helpful resource is the registration guide, which will tell you everything you need to know about CWF Registration. Questions? Please contact Amber Rehberg at amber.rehberg@ces.uwex.edu or Justin Lieck at Justin.lieck@ces.uwex.edu. Your M.E. packet is due by Tuesday, September 4, 2019 and interviews date to be determined. FORMS FOR 2019 WILL BE COMING SOON! Packets turned in late will NOT be eligible for awards or trips! Additional documents to view for your interview if selected. General Achievement Guidelines – These are the minimum expectations for all 4-H members on an annual basis. Be active in club membership (according to club guidelines). Document your project work to include evaluation of each project taken. Enter at least one item to be judged or exhibited publicly outside of the club level for each project in which you are enrolled (at a fair, contest, revue, organized competition, pow wow, etc. in which the member’s skills can be tested/judged by others). Maintain and turn in a record of your year in 4-H.
Have a clean disciplinary record within the 4-H system from September 15 to September 15 of the judging year. Note: Members may add or drop projects no later than April 15 of the 4-H year. Recognizes Cloverbuds who are off to a good start in 4-H. Each club may recommend two Cloverbuds for each grade division. Provides recognition from the Burnett County Home and Community Education Club (HCE) to a foods project member. 4-H members can win this award only once. Have participated in foods revue during current 4-H year. Complete and submit an Award Trip Application (see Member Forms). Approximately 700 youth attend this educational event in Madison each summer. Participants take part in educational seminars and assemblies and meet people from across Wisconsin. They are encouraged to take what they learn and share it with others in their home community. Number of delegates awarded this trip by the Awards Committee is determined annually by the state and the Leaders Association. An individual can be awarded this trip once in his/her 4-H career. 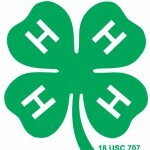 Be in grades 8-10 as of January 1 of the coming 4-H year. Trip costs are currently shared between the Leaders Association and youth. The Leaders Association pays 80% of the registration fee and the youth 20% plus some additional costs such as spending money and related items. Parents are responsible for completing necessary participation and health forms and transportation. Trip costs are currently shared between the Leaders Association and youth. The Leaders Association pays 80% of the trip and the youth pays 20% plus some meals and personal spending money. Parents are responsible for completing necessary participation and health forms and transportation to and from boarding and disembarking points. The Awards Committee may select up to one youth annually to attend the National 4-H Congress. An individual can be awarded this trip once in his/her 4-H career. The Leaders Association currently pays 100% of this trip. The youth pays for some meals and personal spending money. Parents are responsible for completing necessary participation and health forms and transportation to and from boarding and disembarking points.